Our world was first created with a perfect balance in nature. Man, animals, and plants lived in total harmony. But with the entrance of sin, everything changed. Man started eating animals, and animals began eating each other. Thorns and thistles sprouted everywhere. The scourge of sin depleted even the soil. God told Cain, "When thou tillest the ground, it shall not henceforth yield unto thee her strength." Genesis 4:12. This is one reason the Lord commanded the children of Israel to rest the farmlands every seventh year (Exodus 23:10, 11). It would give the ground a chance to recover its vitality and provide a volunteer crop for the poor to eat. But most of God's people ignored this law or simply refused to obey it. Then came a day of awful judgment. 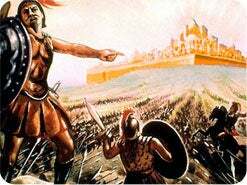 Nebuchadnezzar, the Babylonian king, came to Judah and executed those who had rebelled against him. Others were carried off to the golden city of Babylon. Meanwhile, the land of Israel lay quietly in ruins, "until it had enjoyed her sabbaths: for as long as she lay desolate she kept sabbath." 2 Chronicles 36:21. At the end of 70 years, the survivors returned to Canaan to replant the promised land and to rebuild Jerusalem. For 6,000 years now, Jesus has been sowing the seed of the gospel. The Bible tells us that "one day is with the Lord as a thousand years." 2 Peter 3:8. 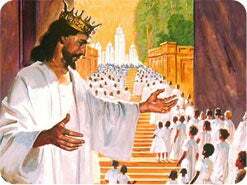 Soon King Jesus will come to harvest the world. Some will be slain by the brightness of His coming, and the rest will be carried off to His golden kingdom. Then this tired old planet will keep a 1,000-year Sabbath! 1. What events mark the beginning of the 1,000 years? 1 Thessalonians 4:16. For the Lord himself shall descend from heaven with a shout, ... and the dead in Christ shall ____ first. Revelation 20:4, 5 And they lived and reigned with Christ a thousand years. But the rest of the dead lived not again until the thousand years were finished. This is the first resurrection. NOTE: The one thousand years of Revelation 20 is often called the millennium. The word "millennium" is simply a Latin composite of two words: "milli," meaning "one thousand," and "annum," meaning "years." The second coming of Jesus and the resurrection of the righteous mark the beginning of the 1,000 years. The saints of all ages (described as "blessed and holy" in verse 6) will be raised in this first resurrection. 2. What else will happen at the first resurrection? 1 Corinthians 15:51, 52. We shall not all sleep, but we shall all be ______________, In a moment, in the twinkling of an eye, at the last trump: for the trumpet shall sound, and the dead shall be raised. Philippians 3:21 Who shall change our vile body, that it may be fashioned like unto his glorious body. 2 Thessalonians 2:8 And then shall that Wicked be revealed, whom the Lord ... shall destroy with the brightness of his coming. Revelation 16:18, 20, 21 And there was a great earthquake, such as was not since men were upon the earth, so mighty an earthquake, and so great. ... And every island fled away, and the mountains were not found. And there fell upon men a great hail out of heaven, every stone about the weight of a talent [about 75 pounds]. Revelation 20:1, 2 An angel ... laid hold on the dragon, that old serpent, which is the Devil, and Satan, and bound him a thousand years. NOTE: See the 1,000-year chart at the end of this lesson for a summary of the events that will take place as the 1,000 years begin. 3. Who will be raised in the second resurrection, and when will it take place? John 5:28, 29. All that are in the graves shall hear his voice, And shall come forth; they that have done good, unto the resurrection of life; and they that have done ________, unto the resurrection of damnation. 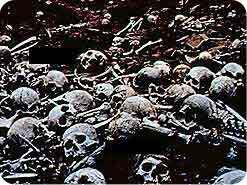 Revelation 20:5 But the rest of the dead [the wicked] lived not again until the thousand years were finished. NOTE: The wicked are raised in the second general resurrection at the close of the 1,000 years. 4. What is the condition of the earth during the 1,000 years? Isaiah 24:1. Behold, the Lord maketh the earth __________, and maketh it waste, and turneth it upside down. Jeremiah 4:23-26 I beheld the earth, and, lo, it was without form, and void; and the heavens, and they had no light. I beheld the mountains, and, lo, they trembled. ... There was no man, and all the birds of the heavens were fled. ... The fruitful place was a wilderness, and all the cities thereof were broken down at the presence of the Lord, and by his fierce anger. Jeremiah 25:33 And the slain of the Lord shall be at that day from one end of the earth even unto the other end of the earth: they shall not be lamented, neither gathered, nor buried. 5. Where will the saints be during the 1,000 years, and what will they be doing? 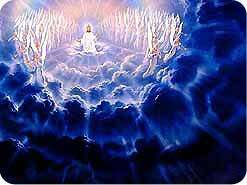 Revelation 20:4 And I saw thrones, and they sat upon them, and judgment was given unto them: ... and they lived and reigned with Christ a thousand years. 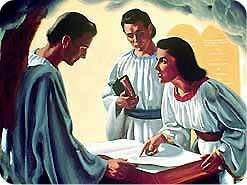 1 Corinthians 6:2, 3 Do ye not know that the saints shall judge the world? ... Know ye not that we shall judge angels? 6. What will happen at the close of the 1,000 years? Zechariah 14:1, 4, 5, 9. Behold the day of the Lord cometh, ... And his feet shall stand in that day upon the mount of ________, which is before Jerusalem on the east, and the mount of __________ shall cleave in the midst thereof. ... And the Lord my God shall come, and all the saints with thee. ... And the Lord shall be king over all the earth. NOTE: At the close of the 1,000 years, the New Jerusalem with the saints inside will descend from heaven and land on what is now the Mount of Olives. 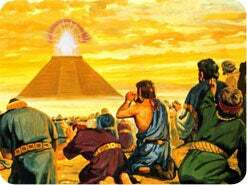 The Lord will flatten the hill to make a great plain for the city's landing site. 7. What will happen next to free Satan from his prison? Revelation 20:5, 7. But the rest of the dead lived not again until the thousand years were finished. ... And when the thousand years are expired, Satan shall be ________ out of his prison. NOTE: After the wicked are resurrected, Satan will once again be free to deceive and manipulate them. 8. What will Satan do when the wicked are raised? Revelation 20:8, 9. And shall go out to ______________ the nations which are in the four quarters of the earth, Gog and Magog, to gather them together to battle: the number of whom is as the sand of the sea. And they went up on the breadth of the earth, and compassed the camp of the saints about, and the beloved city. NOTE: Satan will deceive people into believing that he was unjustly deposed from heaven and that together they can capture the city and take control. 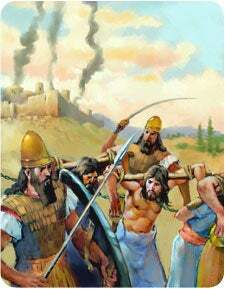 Realizing they are shut out of the holy city, the wicked will organize an attack to conquer the New Jerusalem. 9. At this crucial moment, what will stop everything? Revelation 20:11, 12. And I saw a great white _________, and him that sat on it, ... and the dead were judged out of those things which were written in the books, according to their works. 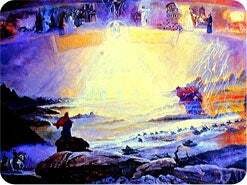 NOTE: God's throne will suddenly appear in the heavens above the city, and the final phase of the judgment begins. The assault on the city of God is thus brought to an instant halt. The books will be opened, and every person's life will be made to pass before him. Everything will be open for the wicked and righteous to see (Luke 12:2, 3). 10. What will happen after the wicked are judged? Romans 14:11. As I live, saith the Lord, every knee shall ______ to me, and every tongue shall confess to God. Philippians 2:10, 11 That at the name of Jesus every knee should __________, of things in heaven, and things in earth, and things under the earth; And that every tongue should confess that Jesus Christ is Lord, to the glory of God the Father. Revelation 19:1, 2 I heard a great voice of much people in heaven saying, ... true and righteous are his judgments. NOTE: The wicked will all freely admit that God has been fair and just and that He tried desperately to save them, but they openly chose to reject Him and to live a selfish life of sin. After this universal admission, the sin controversy will be forever settled and it will be safe to destroy sinners. 11. What will happen next? Revelation 20:9. ______ came down from God out of heaven, and devoured them. 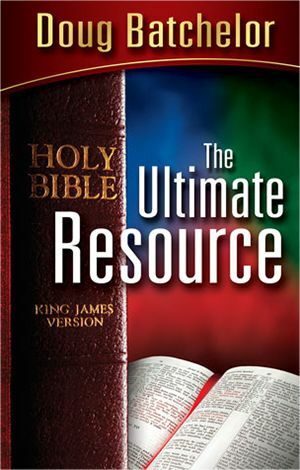 Revelation 20:15 And whosoever was not found written in the book of life was cast into the lake of __________. 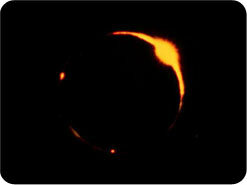 NOTE: God's fire will then fall upon the wicked and form a vast lake of fire all around the city of God. This fire will eventually turn them all to ashes (Malachi 4:3). The devil will have no control over this fire, which is called hell. Instead, he and his angels will also be punished in the fire and then turned into ashes (Revelation 20:10; Ezekiel 28:18). There is no resurrection from this fire, which is called the second death (Revelation 20:14). 12. After the fire goes out, what will God do for His people? Isaiah 65:17. For, behold, I ______ new heavens and a new earth. 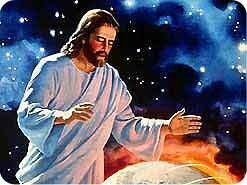 2 Peter 3:13 We, according to his promise, look for new heavens and a new earth wherein dwelleth righteousness. NOTE: At the end of the 70 years of Babylonian captivity, the children of Israel returned to the promised land and rebuilt the city. After the millennium, the saints will witness Jesus create a new heavens (atmosphere) and a perfect new earth, where sin will never again rear its ugly head (Nahum 1:9). 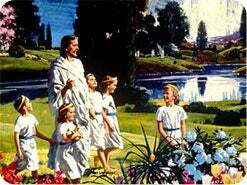 The paradise that Adam and Eve lost by sin will be restored in all of its Edenic glory. Peace, joy, love, and perfect happiness will rest upon God's people forever! 13. Where will God and the righteous finally live? Matthew 5:5. 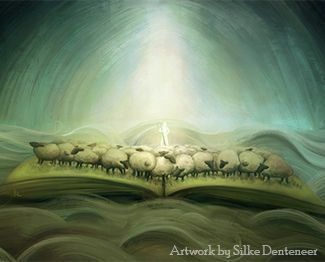 Blessed are the meek: for they shall inherit the __________. 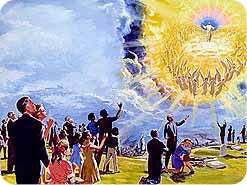 Revelation 21:3 Behold, the tabernacle of God is with men, and he will dwell with them. NOTE: Both God the Father and God the Son will live with their saints on the new earth. Just think of it--having God for a neighbor! 14. Jesus says, "I go to prepare a place for you." John 14:2. He has a mansion for you in the holy city. Will you now accept His offer of life eternal so He may give you the new birth and prepare you for His kingdom? 1. Jesus returns FOR His saints, and the righteous dead are resurrected. 2. 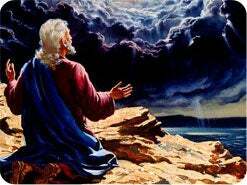 Wicked are slain by the Lord's coming, plus devastating earthquake and hail. 3. Living righteous are changed, then caught up to meet the Lord in the air. 4. Cloud carries the righteous to heaven. 1. Saints in heaven participate in judgment of the wicked. 2. Satan and his angels are forced to remain on earth in total devastation and darkness. 3. No people are alive on earth. 1. Jesus returns WITH His saints, and the holy city descends upon the Mount of Olives. 2. 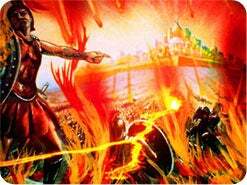 Wicked are resurrected, and Satan persuades wicked to attack the holy city. 3. Wicked are judged, then punished by fire from heaven that eventually devours the lost. 4. God creates new heaven and a new earth on ashes of a purified earth. The term "bottomless pit" from Revelation 20:1 is often misunderstood. It is translated from the Greek word "abusos," the root of the English word "abyss." In the Greek Old Testament, this word is used to refer to the formless, dark earth as it was before Creation. "And the earth was without form and void and darkness was upon the face of the deep." Genesis 1:1, 2. The word "abusos" is used again in Luke 8:31 to illustrate a condition where demons have no one to possess or manipulate. During the 1,000 years, the devil is chained by circumstances, "that he should deceive the nations no more." Revelation 20:3. A literal chain could never chain a spiritual being. Only one thing would prevent him from tempting people, and that is if there were no people alive! 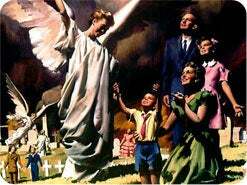 When Jesus comes, the wicked are all slain and the righteous taken to heaven, so Satan and his angels are confined to this planet with no one to tempt. For 1,000 years they will roam and behold the fruit of their rebellion. No more galling chain of circumstances has ever been forged. It is in this manner that Satan and his angels are bound. "And they shall be gathered together, as prisoners are gathered in the pit, and shall be shut up in the prison, and after many days shall they be visited." Isaiah 24:22.